House Speaker Tim Moore, R-Cleveland, says an ethics complaint filed against him by a Washington, D.C.-based nonprofit research organization is tainted by election-season politics. Campaign for Accountability filed the complaint Monday, March 5. It alleges Moore might have improperly used the power of his office to skirt state Department of Environmental Quality underground storage tank rules regarding a property he jointly owned. The complaint speculates Moore could have used his office to help steer grants and other incentives to the buyers. Moore is vice president and part owner of Southeast Land Holdings LLC, which bought the former Townsend poultry plant in Siler City for $85,000 and later sold it to Mountaire Farms for $550,000. Campaign for Accountability obtained emails and other documents regarding Moore’s dealings with DEQ. The complaint claimed it was suspicious the agency suddenly reversed its decision to enforce rules against Southeast Land Holdings for failing to remove the petroleum storage tanks after saying it was unlikely an extension would be granted. Yet DEQ produced no documents or emails to show why that extension was granted. 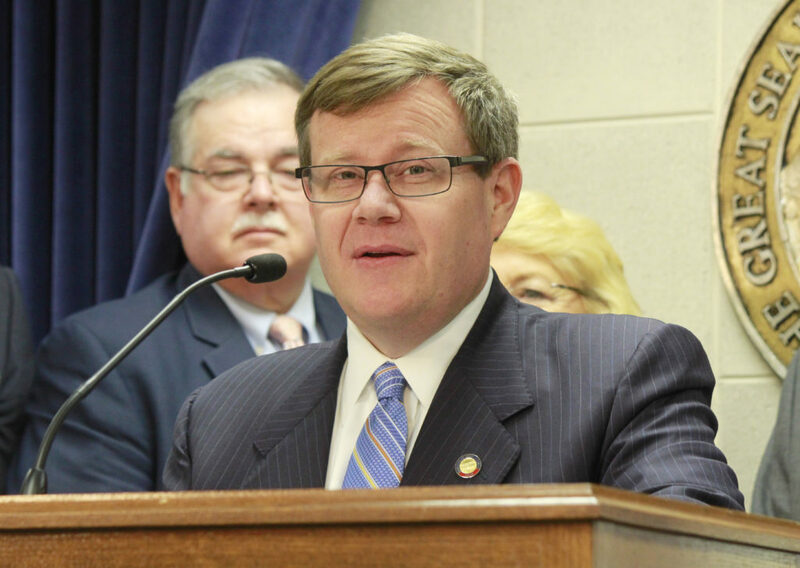 “If Speaker Moore used his position in the General Assembly to avoid the regulations and penalties to which other North Carolina landowners are subject, and thereby reaped a $465,000 profit from the sale of his property, he should be held accountable,” the group’s Executive Director Daniel Stevens wrote in the complaint. “Speaker Moore directly intervened with state officials to avoid the issuance of fines for failing to abide by the state’s environmental laws. Speaker Moore appears to have managed to delay DEQ from engaging in any enforcement action, giving his company time to secure a buyer for the property, eventually allowing him to sell the property for $465,000 more than the purchase price, just three years earlier,” the complaint said. The complaint questioned whether Moore intervened with potential buyers to buy the property or influenced state or local officials to direct state money to Mountaire to incentivize the purchase. The Chatham County Board of Commissioners approved $1.5 million in tax incentives, and Siler City Town Council approved $800,000 in property tax incentives. North Carolina issued a $1.5 million grant from the state Rural Infrastructure Authority for Mountaire to expand its wastewater service. Moore appointed five of the 15 RIA members. Stevens said the State Ethics Commission should investigate Moore and refer the matter to the Legislative Ethics Committee for further action. Currently, the ethics commission has no members. Gov. Roy Cooper hasn’t named members as he fights in court to stop legislation that merged it with the State Board of Elections. “This complaint is a meritless, election-year, political ploy,” Moore said in a written response to the complaint. The documents Campaign for Accountability submitted as part of its ethics complaint appear to at least partially corroborate Moore’s contention that the decision was above board. The complaint states DEQ Inspector Rose Pruitt was preparing to act against the property owners, who received one extension in October 2014 and paid outstanding fees but hadn’t removed the storage tanks. After getting a notice that DEQ intended to move forward with enforcement, Moore requested another extension. Linda Culpepper, director of DEQ’s Division of Waste Management at the time, “apparently recognizing the potential political sensitivity of Inspector Pruitt’s actions,” elevated the matter to her superiors, who forwarded an email to then-DEQ Secretary Donald van der Vaart and then-Chief Deputy Secretary John Evans, the complaint said. “That’s what we always did, which didn’t always make us popular with the General Assembly,” van der Vaart told Carolina Journal. He said the agency treated all enforcement actions equally. Van der Vaart said he had only a faint recollection of the matter. But he thought it wasn’t unusual to grant extensions delaying enforcement actions with good cause. An example might be an owner selling property to a buyer who had promised to remove the storage tanks. Van der Vaart said he didn’t know what those points — which Campaign for Accountability is seeking — might be. DEQ told the organization it could find no email record, and Culpepper wasn’t sure one was ever sent discussing the points. It wouldn’t be unusual for Moore to deal directly with DEQ staff rather than the legislative liaison, van der Vaart said, because Moore would have acted as a private citizen rather than a lawmaker. Campaign for Accountability says on its website it “works on behalf of the public interest to expose corruption, negligence, and unethical behavior wherever it may occur.” Critics call it a progressive organization that focuses on Republicans. Update: Daniel Stevens emailed CJ after this article was published, taking issue with Speaker Moore’s contention the ethics complaint was related to the 2018 election. “We first asked N.C. DEQ for [documents] in February 2017, and we sent our second request in May. The only reason it’s taken so long to get this information out there is because DEQ dragged its feet in responding to our requests. We would have released these emails months ago if not for DEQ’s slow responses,” Stevens said.